A woman killed in a hit-and-run in south London was "just left to die". 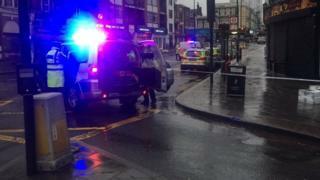 The 29-year-old from Wandsworth was hit by four vehicles on a pedestrian crossing on South Circular Road at 06:48 GMT on Monday. None of the drivers stopped, police said. Navin Bagan, 37, who works at the nearby Tulse Hill cafe, added the drivers were "heartless". One resident said the road layout "encourages dangerous driving" and has written to an MP to urge for change. The woman was hit by two lorries and two cars. Her next of kin have been informed. In the letter shared on social media to Chuka Umunna MP, Ross Runs wrote: "As both a pedestrian and a driver, the junction at Tulse Hill encourages some of the most aggressive driving I have seen in London. "If there is an opposite to 'traffic calming' then this is it." He said the current design encouraged speeding and the road had become "a racetrack of sorts". "I hope that nobody else has to needlessly lose their life due to poor urban planning on a road that encourages excessive speed and dangerous driving," he added. Mr Umunna is the local MP for Streatham, not Dulwich & West Norwood where the crash happened. However, he and Helen Hayes, who represents the neighbouring constituency, said in a joint statement their thoughts were with the victim's family and friends. "Lambeth Council is working closely with Transport for London on urgently needed changes to the Tulse Hill gyratory which will make it safer for pedestrians and cyclists," the statement said. "We are pushing for these works to be delivered as soon as possible, and for any lessons which emerge from the investigation into this appalling incident to be acted upon immediately." Police have appealed for any witnesses to the crash and for the drivers to get in contact. "This road is sometimes very busy in the mornings, but that's not an excuse for a car to hit a lady and run off," Ms Bagan said. "I'm sure they will find them - it's a busy road, there are lots of security cameras."